A lot of people ask us this: what is our secret? What makes our boxers last so long in the ring? Today we are going to entertain these questions and more because we want to emphasize on the importance of properly training and getting the best out of your work-outs. All of the advice we will give to you in this newsletter is equally important and is not numbered off. The first technique that we implement at our gym is focusing on breathing. Breathing is super important, not in just boxing & fitness, but also in everyday life. But, how come? One of the first obstructions from preforming well that you will come about is your respiratory system aching. Your stomach, kidneys and lungs giving you that 'winded' feeling after a few rounds could mean your loss in a boxing match. We have witnessed some people out of breath & winded after the first round! Indeed, it is common to hear at our gym: "breathe, breathe!". We are saying this because we want you to last. But, how do you improve your breathing? We set up different exercises from running & stretching at the same time, to the skipping ropes, and all the way to making laps outside. No cheating, do it! The most important factor is that you are making progress. Breathing is closely linked to speed, agility and even reaction time. If you really want to have fast fists and feet, start by working on your breather. It really does give you extra energy if you have a good respiratory system. Even outside of the ring, in everyday life, good breathing means a good circulation of blood throughout the body. Which, in turn, gives you positive vibration and a positive mentality. Spitting out all that phlegm and unwanted substances will improve your overall health. You will feel like a new you. Our guarantee. 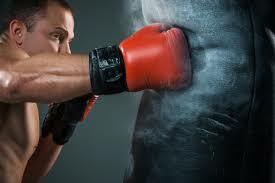 At our boxing gym in Vaughan, our long-term members can do several rounds without a problem. The trick is consistency and having your body being used to being under pressure at certain times. Going for a run or doing some skipping rope is not enough. You have to seriously put in the work several times a week in order for you to really have that professional boxer vitality. Remember, it is never too late to be fit. The only limits are the ones you have set for yourself. What you need is the right tools & mentality and there is no telling how far you can go. But, what does that mean "the right tools" ? You having several stations set up with a timer is a good start. Being geared and being in a good atmosphere is another. However, nothing beats having a good coach. The difference is like night & day. Our head coach, Alex, has a keen eye for redundancy and plateaus when it comes to progress in boxing & fitness. He really does know how to revitalize the body. So, when you do see a boxer performing well, a lot of the times it comes from the inspiration from the coach. Now, that you have finished reading all of this, you might be excited or you might not be excited, the truth is it is only after you break that first sweat is when you really get into excitement. And this happens, each & every time. When your body is not warmed up, you are also not mentally charged up as you should be unless you have made significant progress to the point that just by looking in the mirror you are excited to workout. We are dedicated for you to reach these levels, this is what we are all about and we want to share our expertise with you. So, why not get charged up and get energetic at our gym and see how it is like to be in the 'mode' or the 'zone' for yourself? We would love to get in touch with you and we always keep a 100% can-do attitude here for everybody. Give us a call at 416-569-9381 or contact us today to hear how we can make a true boxer or fitness professional out of you. We are looking forward to be hearing from you and as always stay focused & fit forever. Stay tuned for more boxing & fitness related news, advice, info and much, much more! We would like to wish you all the best, from the Golden Gloves Fitness team.